Everyone loves to know who people were before they became famous. Were they serving up fries with that or were they offering towels to the well to do after they washed their hands in the rest room? We certainly enjoy these back stories as they offer a glimmer of hope that if these people made it somewhere when it seemed at one time that their lives were going nowhere, then we might one day accomplish the same. It may even give us a little insight into what made those we admire. That said, if their rise to the top is as tame as fashionista, Coco Chanel’s, as told in COCO AVANT CHANEL, it isn’t as easy to get all that excited. It’s not that Chanel didn’t have humble beginnings to overcome, obstacles to tackle or brave paths to forge. It’s just that the manner in which French director, Anne Fontaine, tells them is not terribly compelling. 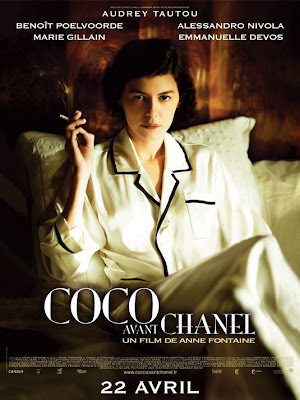 Chanel, played by Audrey Tautou, was abandoned by her father as a girl after her mother died. She was placed in an orphanage with her sister and when she grew up, she longed to perform on the stage. When that didn’t pan out as she had hoped, she basically finagled her way into the home of millionaire, Etienne Balsan (Benoit Poelvoorde), and stayed there until she had figured out what she wanted to do with herself. What she wanted was to turn her hat-making hobby into a career in fashion. What she accomplished instead was the creation of an empire. Chanel’s story is one that deserves telling but it doesn’t make for a very engaging film. She stands apart as a fashion icon because she always held true to her own vision and she stands alone as a human being because she refused to compromise herself for love and security. 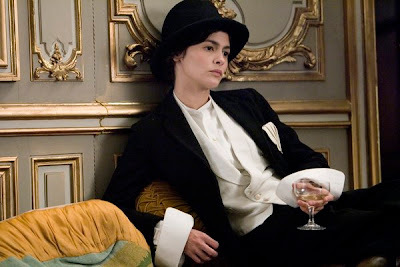 Fontaine paints her as a tragically unhappy figure and Tautou follows suit with a near-permanent scowl on her face. There is never any moment where her success is celebrated or where her journey is so dire that any success at all is championed by the audience. Without any visual transformation, COCO AVANT CHANEL never comes anywhere near the elegance that made Chanel what it was. I can’t wait to see this movie, though it’ll have to be a while, sadly enough. It’ll make a great rental. There is nothing about it that warrants a theatrical viewing. Do you think Tautou is deserving of an Oscar nod for this movie? I’m hearing buzz.